With China, India and UK having some of the busiest rail networks in the world, maximising the life expectancy of the trains and track and reducing downtime is extremely important. Early failure of any component can be very costly and cause major disruptions to commuters. At Clapham Junction, the UK’s busiest station, at peak times up to 180 trains per hour pass through one of the 17 platforms. If every train has 10 carriages, there will be at least 440-wheel passes over one point of rail in this time. Over time this will cause fatigue and wear and the rail will need replaced before failure occurs. To delay the wear process, specialty greases are used between the wheel and the rail flange corners. 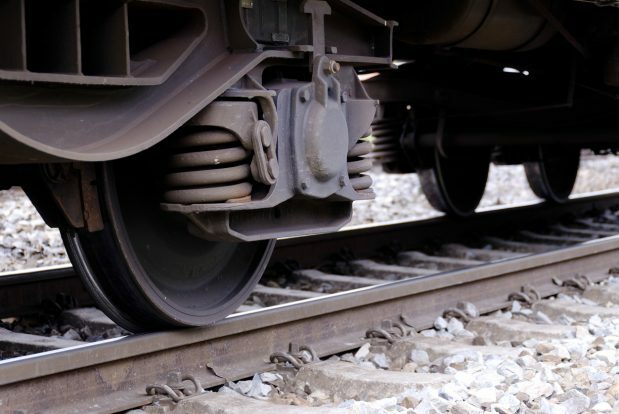 Railway grease manufacturers are continually researching alternative base oils, thickeners and additives and developing new formulations to improve the performance of their products. Using the MTM2 conditions within the wheel-rail flange contact can be emulated and frictional properties of the greases measured. These results can be analysed and benchmarked against market leading formulations to determine their suitability for the application. 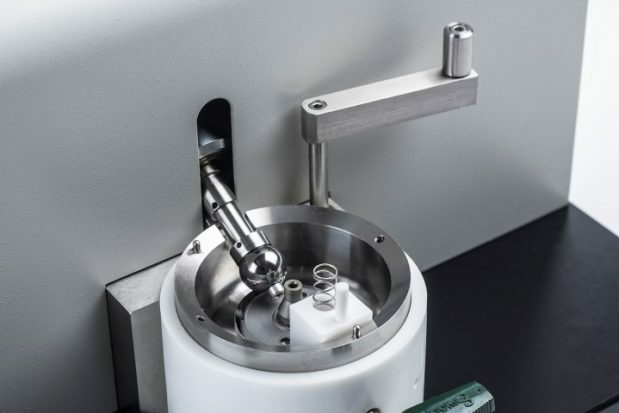 The MTM2 uses two independently driven specimens, a rotating ball loaded against a rotating disc, to produce a contact with varying slide to roll ratios. 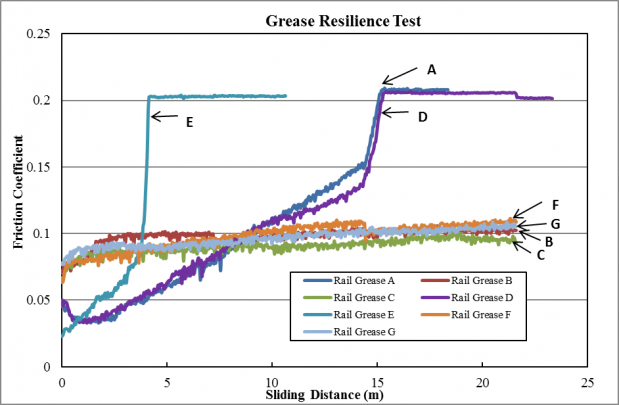 A grease resilience test has been designed to study the ability of the grease to maintain a low friction coefficient during long sliding distances, which corresponds to many wheel passes of the rail flange. The ball is loaded against the disc with a 50N load to produce a point of contact with a pressure of 1.1 GPa. The rolling speed was set at 0.2 m/s, with a slide/roll ratio of 2 %. The speed was set purposely low to minimise any flash temperature build up on the small specimens, which would be unrealistic compared to the real conditions. Over time the grease is slowly squeezed from within the contact. This is indicated on the MTM2 with a rise in friction coefficient. Failure will occur once all the lubricant has been squeezed from the contact and a large jump in friction is seen which indicates the start of high wear due to starvation in the contact. Greases A, D and E, show an initial low coefficient of friction of below 0.05, this then rises sharply during the test to the maximum value of 0.21, indicating loss of the lubricant from the contact and the occurrence of wear. Greases B, C, F and G show a gradual increase of the friction coefficient during the test, but do not show a characteristic failure. The greases that fail during the test contain vegetable base oils, the addition of a synthetic ester delays this failure somewhat. Greases A and D, which have a similar composition, fail at the same sliding distance. Greases B, C, F and G maintain a low coefficient of friction throughout the test, these greases use mineral base oils and synthetic esters. The addition of solid lubricants, which are present in greases C and G, have no noticeable effect on friction in this test. Although this may help to increase the sliding distance before failure, the solid lubricants are likely to help maintain a low friction coefficient even after the base oil and thickener have been squeezed from the contact. This is done by forming low shear strength layers on the metal surfaces. An extended sliding distance test was performed for grease G, this eventually showed failure after 50 m of sliding. Further tests have been run on the MTM using railtrack material as specimens and including some of the external factors the rail- wheel contact is subjected to such as dirt particles, rain water and leaves to gain a better understanding of the railway grease performance.